H. TURNER, S. GORI & R. SALISBURY. Costellariidae (Gastropoda) of the Maldive Islands, with descriptions of nine new species. 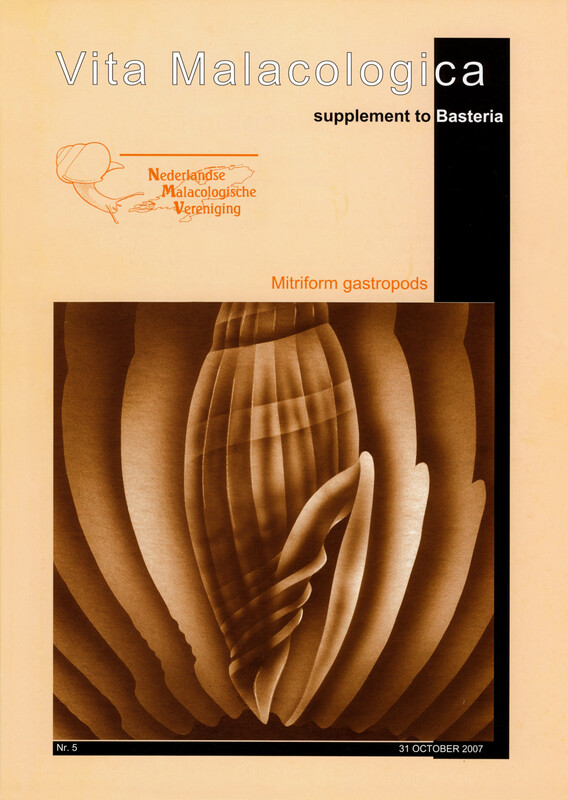 Notes on the natural history of the Maldive Islands are followed by a historical outline of the occurrence of Mollusca in the archipelago, in particular the species of Costellariidae. The following nine species are described as new: Vexillum (Costellaria) cookorum spec. nov., V. (C.) fraudator spec. nov., V. (Pusia) silviae spec. nov., V. (P.) kuboi spec. nov., V. (P.) torotortum spec. nov., V. (P.) thila spec. nov., Thala maldivensis spec. nov., T. aubryi spec. nov. and T. manolae spec. nov. Lectotypes are designated for two Thala species, described as Mitra recurva Reeve, 1845 and M. mirifica Reeve, 1845. Data on morphology, systematics, nomenclature (with the main synonyms) and distribution of the 69 species of Costellariidae that have been recorded for the Maldives are presented, with many illustrations, and references to collections where Maldivian specimens are stored. The biogeographical and ecological aspects of the Maldivian Costellariidae that are actually known from Eastern Arabia, the Seychelles, the Maldives, and India are listed. Type locality: Philippines, N. Bohol. Type locality: Kwajalein Atoll, Enubuj-Ennylabagan, reef oceanside, in cave at 18 m.
Type locality: Maldive Islands, North Male Atoll, Helengeli, house-reef, at 25 m in coral sand. Type locality: Japan, Okinawa, Seragaki, at 25 m.
Type locality: Maldive Islands, South Male Atoll, Guraidhoo Kandu, at 35 m in an oceanside drop-off cave. Type locality: Maldive Islands, Felidhoo Atoll, Huraru Kandu, at 35 m at east oceanside drop-off, in cave. Type locality: Maldive Islands, Ari Atoll, Athurugau Island, bottom of reef slope at 30 m.
Type locality: Maldive Islands, South Male Atoll, Guraidhoo Kandu, at 35 m in sand. M. HERRMANN. A new species of Vexillum (Gastropoda, Costellariidae) from the Philippines. Vexillum albofulvum spec. nov. is described from the Philippines and is compared with V. plicarium (Linnaeus, 1758) and V. pedroi Poppe & Tagaro, 2006 from the same area and the same depth of water between 8 And 25 m.
Type locality: Philippines, Palawan, Balabec. G. ROSENBERG & R. SALISBURY. New species of Thala (Gastropoda: Costellariidae) from Hawaii, with comments on other Indo Pacific species. We show that the three species of Thala known from the Hawaiian Islands are endemic, rather than having broader Indo-Pacific distributions as previously thought. Records of T. todilla (Mighels, 1845) outside the Hawaiian Islands are misidentifications, as are records of T. milium (Reeve, 1845) and T. exilis (Reeve, 1845) within the Hawaiian Islands. The latter are described as endemic species, Thala lillicoi spec. nov. and Thala hilli spec. nov. respectively. Neotypes are designated for T. todilla and T. milium, with the latter becoming an objective senior synonym of, and the valid name for, T. illecebra (Melvill, 1927), which is endemic to Japan. Thala angiostoma Pease, 1868, from the Tuamotu Archipelago, is confirmed as a valid species rather than a synonym of T. mirifica (Reeve, 1845). With these revisions, the Recent diversity of Thala increases to 23 species; only 3 species were recognized in 1970. This eight-fold increase in known diversity is concordant with other recent studiews showing that levels of diversity and endemism in the Indo-West Pacific have been substantially underestimated. Type locality: Midway Island, Hawaiian Islands, U.S.A., at 15-18 m depth. Type locality: off Kepuhi Point, near Makaha Beach, Oahu, Hawaiian Islands, U.S.A., at 55 m.
H. TURNER. Mitra (Mitra) marmorea (Gastropoda, Mitridae) a new species from Madagascar. Mitra (Mitra) marmorea spec. nov. from shallow subtidal waters off Madagascar resembles several Indo-Pacific species. Here it is compared with and differentiated from similar forms of the variable species M. (M.) bovei Kiener, 1838, and with M. (M.) pseudobovei T. & V. Cossignani, 2005 M. (M.) manuellae T. & V. Cossignani, 2006, and M. (Strigatella) abacophora Melvill, 1888. Type locality: Madagascar, Faux-Cap, 25°33’S 45°32’E at 5-10 m.
A.M. DEKKERS. Description of a new Vexillum species (Gastropoda: Costellariidae) from Indonesia. Vexilum maduranum spec. nov. is described from the island of Java, Indonesia. The species is compared with V. (V.) jukesi (A. Adams, 1853), V. (V.) formosense (Sowerby III, 1889), V. (V.) curviliratum (Sowerby II, 1874) and a third not yet described species, erroneously called V. (V.) weberi (Bartsch, 1918). The new species is probably an Indonesian endemic. Type locality: Indonesia, Java, Pulau Madura, Ketapang, 6°54’S 113°17’E in littoral to shallow water on rocks and gravel.